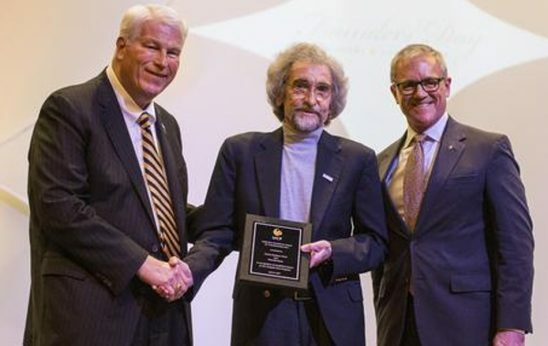 Chuck Dziuban (center) receives the Collective Excellence Award from President John C. Hitt and Provost Dale Whittaker. A new award honoring a UCF team that has strengthened the university’s impact was presented Wednesday to Chuck Dziuban and Marcella Bush from the Research Initiative of Teaching Effectiveness for their work with the Tangelo Park Project in Orlando. Dziuban, director of the initiative, and Bush, editor/research associate, were presented the Collective Excellence Award and $15,000 to expand and increase their work. The inaugural presentation of the award was made during the university’s annual Founders’ Day Honors Convocation in the Student Union. Dziuban accepted the award for the team during the ceremonies. Tangelo Park is a community just southeast of the International Drive tourist area. In the 1980s and 1990s, the urban community experienced low socioeconomic demographic conditions: drug problems, poor school attendance, declining test scores and high school dropout rates. With the financial backing of Harris Rosen of Rosen Hotels and Resorts, the program has addressed the area’s educational, social and economic concerns with the collaborative support of several Tangelo Park community organizations. The community has become a model that assures childcare programs, parent-effectiveness training, and post-secondary education or training opportunities at no cost to the community. For nearly 20 years, Dziuban and Bush have volunteered for the Tangelo Park Project as UCF liaisons, consultants and advisory board members, said Dale Whittaker, UCF provost and executive vice president. Whittaker said the new award will recognize a team each year whose work exemplifies one of seven categories: powering partnerships, creating access, dreaming big, unleashing potential, harnessing scale, amplifying impact or transforming lives. All of the recipients can be seen here.